You can now view my GPS history for a date inside Google Earth. Put a recent date in the Get History textbox and push "Go"
Once it loads, click "View History in Google Earth"
Thanks to Frank Taylor for the suggestion. One of our clients needed some software installed on his computer today. However, he didn't have the cd that was needed. So I VPN into his network, remote desktop into his laptop, VPN'd on his laptop back to our network, shared the cd drive on our server and granted him access to it, put the software into the cd drive and installed away. I felt like I was on the Office Depot commercial. "Use your easy button to find my easy button?!?" A year ago we were working in Kyle's basement, now look at us. 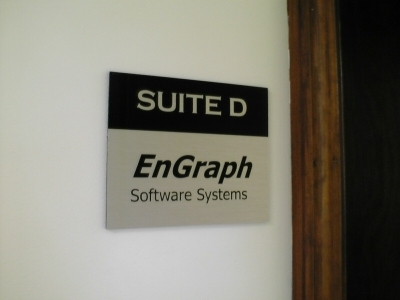 We even have an official nameplate at our new office! !